Patients that have previously had frozen shoulder. Although the beginning of symptoms may coincide with a shoulder injury or trauma, often these are only very minor events and many patients report no injury. 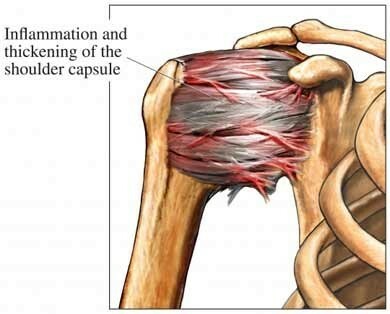 Frozen shoulder affects the lining (synovium) and capsule of the shoulder joint. These structures become abnormally inflammed and as a result very stiff and painful. The symptoms of pain and stiffness are usually severe and disabling. Pain is often constant and worse at night. Most patients have trouble sleeping. Frozen shoulder is usually a self-limiting condition, i.e. it gets better by itself irrespective of any treatments. The majority of patients make a complete recovery. The time from beginning of symptoms to recovery is usually 18 24 months. Many treatments have been proposed for frozen shoulder, most of these at best help with the pain. None of these treatments have been shown to cure or speed up the healing time. Oral analgesics: Help with the pain, and sleeping. I routinely prescribe paracetamol, anti inflammatories, or narcotic analgesia. Steroid injections: Steroid ( celestone ) plus local anaesthetic if injected into the shoulder joint can signifigantly help pain. It usually will not affect the stiffness. Physiotherapy / Exercises: In the early phase of frozen shoulder this will tend to increase the amount of pain. I reserve exercises for late in the disease process when the pain has resolved but the stiffness has not. To keep this information with you, see the PDF download here.